I’ve made this dish probably three or four times, each time with slightly different vegetables or a different type of noodle. 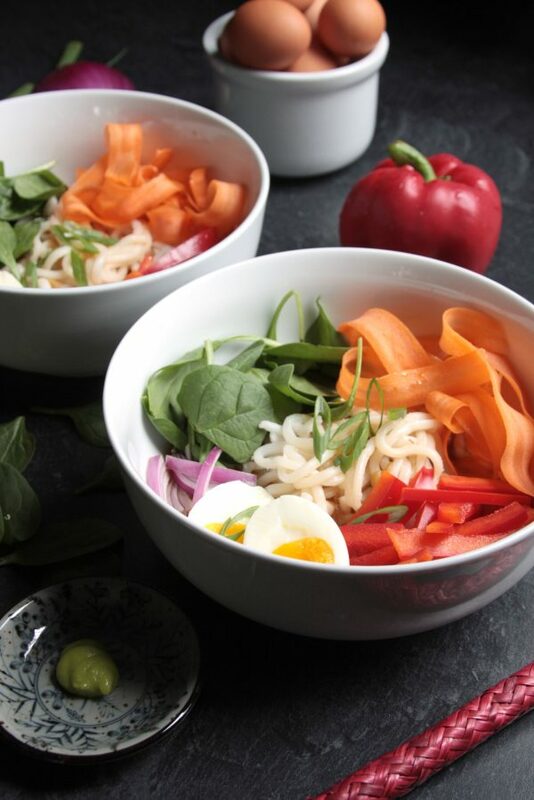 There are a variety of vegetable combinations that work great but nothing really beats the awesome chewiness of udon noodles. You can really use any noodle you like but I highly recommend trying fresh udon noodles, not dried. Dried noodles never cook up as thick as the fresh ones do. The first time I made this, I didn’t know what mirin or miso paste were, so it took a bit of extra time to collect all of the ingredients, but it was so worth it. Now we make it pretty regularly, (or really every time our friend Mary has exam week and requests it 😉 ) so we keep the broth ingredients on hand. I also spent quite a bit of time looking for the giant bowls I use to serve the soup in. Regular soup bowls just weren’t going to cut it. They needed to be big enough to accommodate the massive noodles, a good amount of broth and whatever add-ins we wanted to throw in there. There are a lot of really beautiful bowls I came across, but they can be pretty pricey. In the end, I found these white porcelain serving bowls at Meijer, of all places. They’re technically large enough to be serving bowls but they’re small enough that they’re the perfect size for udon soup too. Plus they were only about five bucks each. Win! 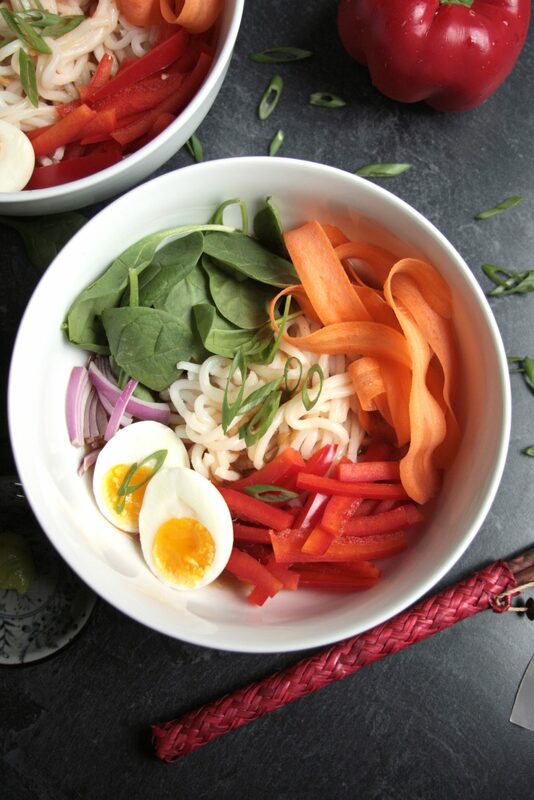 A flavorful, salty broth loaded with fresh veggies and chewy udon noodles. Add any veggies you like depending on the time of year and your taste preferences. Broccoli, sugar snap peas, corn, extra firm tofu and jalapenos are all great additions that I've tried with this dish. 1 scallion Cut the root end off of the scallion and discard. Thinly slice the scallion on an angle, separating the white from the green parts. 1 Tbsp white miso paste **see Recipe Notes section for more info. 4 servings udon noodles *see Recipe Notes section for link to noodles I use. 2 red bell peppers Remove the stem, seeds and ribs and thinly slice. 10 ounces fresh baby spinach Can substitute baby bok choy, leaves roughly chopped. The broth can be started well in advance, just leave the miso paste out until just before you're ready to serve it. I've even made the broth in a crock pot in the morning and left it on low all day until dinner time. Heat the vegetable oil on medium high in the bottom of stock pot until hot. Add the ginger, white parts of the scallion and garlic and cook until lightly browned and fragrant. Add the vegetable broth, soy sauce, star anise, cinnamon and mirin and simmer for at least 20 minutes. Taste the broth before adding the miso paste to determine if more or less is needed. I do not salt or cook any of the vegetables ahead of time so I lean towards a saltier broth to compensate for the lack of salt on the vegetables. Just before you're ready to serve it, remove the cinnamon and star anise, put the miso paste in a small bowl (more or less to taste), ladle some of the hot broth over it and stir until dissolved. Then add the mixture to the stock pot and stir. The miso paste will get grainy if you cook it in the broth for too long and it can be difficult to dissolve if you add it directly to the stock pot so it's important to save it until the end and dissolve it in a small bowl first to ensure it's completely combined. 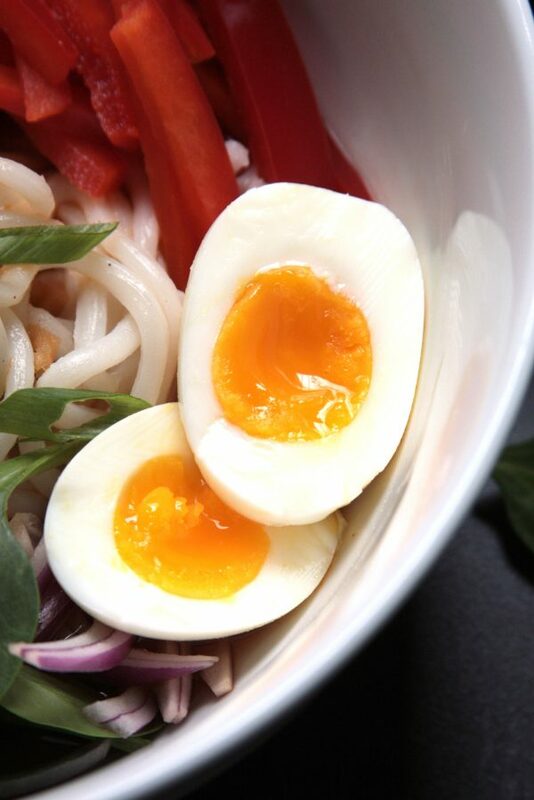 While the broth is simmering, soft boil the eggs then set them aside. Prepare the noodles according to the package instructions. I always buy fresh noodles that only need to be quickly heated up on the stove top or in the microwave. I've never found dried noodles that were anywhere near as thick or delicious as fresh noodles so I highly recommend buying fresh. They can be found in the world foods aisle of the grocery store or you can purchase them online*. Use a vegetable peeler to peel the carrots. Then lay a carrot down on the counter, and use the peeler continually in one direction to create carrot ribbons. Set aside. 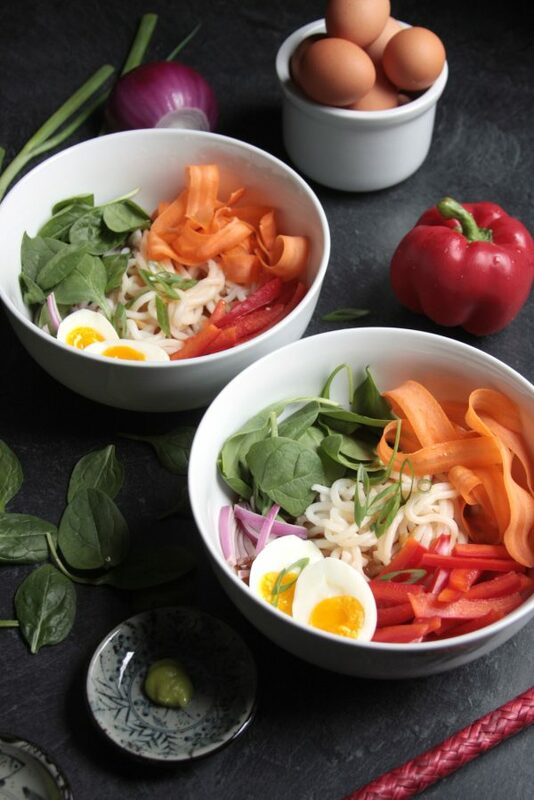 Add one serving of noodles to each bowl. Divide the add-ins evenly between the bowls or let your guests add whatever they'd like. Ladle the broth into each bowl and serve with soy sauce and wasabi on the side. *These fresh udon noodles are similar to the brand I am able to buy at our local supermarket. **White miso paste, or shiro miso, may not be readily available at standard grocery stores. I had to go to a local Asian supermarket to find it. They sometimes come in bags and other times in small tubs or you can purchase it online. Amazon has a wide variety to choose from, many with free shipping if you have Amazon Prime. Have you ever bought serving dishes or kitchen tools specifically for one dish or am I the only one who regularly does this? 😛 What are your favorite add-ins for udon soup? 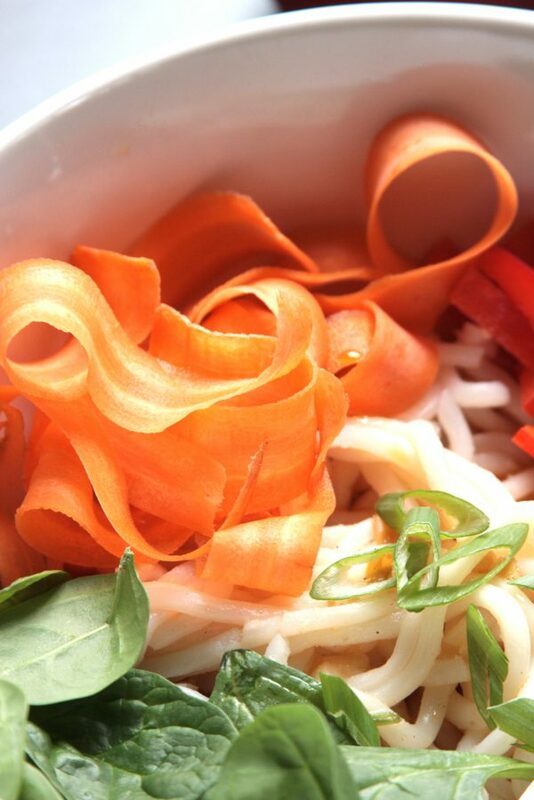 Are there any noodles you’re as crazy about as I am for udon? Comment below!